Hi everyone, today I'm here for Craftie Café and for today’s project, I’ll be using the Avery Elle - Otterly Fantastic stamp set along with the Scripty Love dies from Lawn Fawn to create a Valentine’s themed card. To begin, I first stamped out my images from Otterly Fantastic, coloured them with Copics and cut out my images using the Coordinating Dies. I set them off to the side and moved on to the background. I cut down a piece of watercolour cardstock and used some Waves Dies from Mama Elephant to cut out four separate wave pieces that I can layer together. Once they were cut out, I took my four colours of Distress Oxide Inks (Twisted Citron, Cracked Pistachio, Peacock Feathers, Salty Ocean) and ink blended each of the four pieces with each colour. I then cut down a card base, added foam tape along the back of each of the wave pieces and adhered them down onto my base. Next up, I adhered down all my images onto my background also. Then, I took a piece of watercolour cardstock and used some Picked Raspberry and Spun Sugar Distress Ink and ink blended a gradient onto the bottom of it. I used the Distress Sprayer Tool to add some water droplets on my background, then dried it off with a heat tool. I then used the Scripty Love Dies from Lawn Fawn to cut out my love word. I added foam tape onto the back and adhered it down onto the bottom left hand side of my scene. 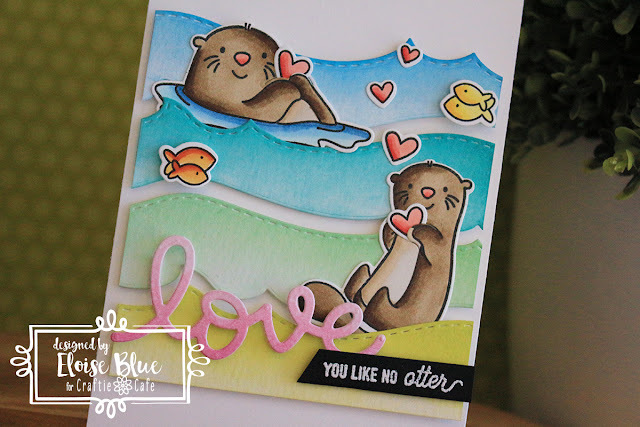 Lastly, I white heat embossed the ‘You Like No Otter’ sentiment from Otterly Fantastic onto a black strip of cardstock that I cut from the Slanted Sentiment Strips Dies from My Favorite Things. I adhered it down to my card with more foam tape and my card was complete. 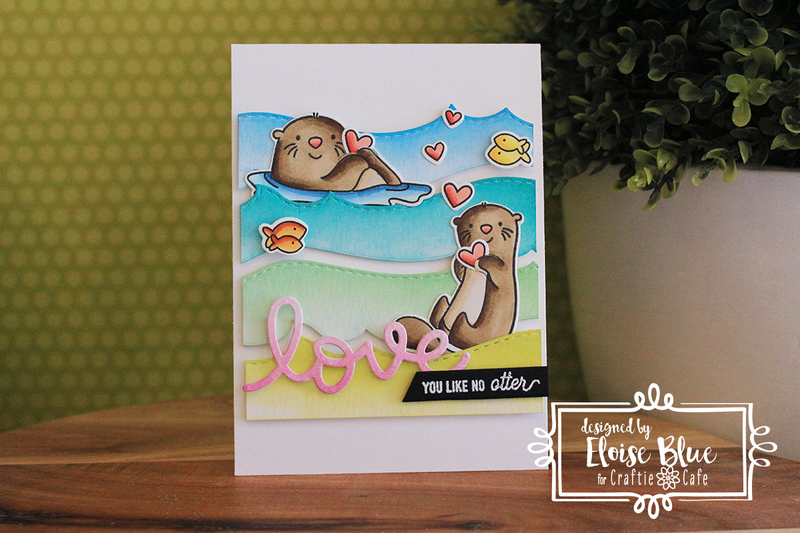 A bit of a different design and colour scheme for a Valentine’s card, but super cute! Awww so sweet Eloise, a great idea colouring the waves in different shades. Love that. What a gorgeous layout.....I'm definitely going to use this layout for inspiration!!! Thanks so much!